Orlando’s Pulse nightclub will host a fundraiser on Thursday, its first event since a gunman killed 49 club-goers on June 12. The theme will be “Latin night,” the same event Pulse hosted the night of the attack. The event, which will raise money for Pulse employees, will be “half party, half memorial,” the Orlando Sentinel reported. It will not be held at the nightclub, which remains closed. Instead, the fundraiser will take place at Wildside BBQ & Grille, a restaurant two miles away in downtown Orlando that Poma’s husband owns. 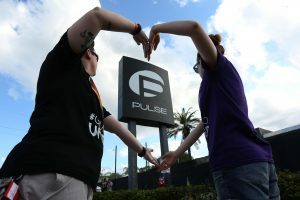 Pulse spokeswoman Sara Brady told the Orlando Sentinel that the change of location shouldn’t affect the nature of the party, and that Pulse entertainers and drag queens would be performing. The event will begin at 5 p.m. but is expected to carry on through the night.